Posted on February 9, 2018 by Aliya A.
King’s Cage picks up where Glass Sword left off. Mare is now Maven’s prisoner, and will be for six long, torturous months. Although Maven wasn’t born a monster, and his mother is dead, he continues on his path while at the same time being completely aware of it–and in some ways, even choosing it. Although Elara is gone, Maven still makes his own barbaric decisions in order to keep his power. He alienates his court, and most of the Silvers at court can see that he’s unstable and his reign is weak. During her imprisonment, Mare learns that Maven harbors feelings for her, but in a twisted way–he’s more or less obsessed with her, continually demonstrating how his mind is still affected by Elara’s manipulation. The first part of the book was slow–it was basically just Mare’s imprisonment, but it makes the second half of the book make more sense, because it sets up the characters’ growth. We also learn more of Maven’s background and the reason for the Lakelander war (which I thought was kind of obvious, but it was interesting watching the characters’ reactions to the knowledge). There were also two new points of view: Evangeline and Cam. Regarding Cam, I felt like she was put in to give a contrast to Mare in certain ways, but it was kind of obvious. Evangeline shows a surprising side of her that we haven’t seen before, as we were never able to read from her point of view. I thought it was interesting, and it gave some background into her house and why her parents make the decisions they do. 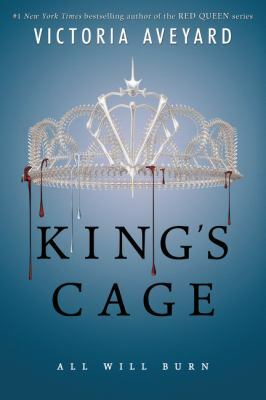 King’s Cage by Victoria Aveyard is available for checkout from the Mission Viejo Library. It can also be downloaded from Overdrive. This entry was posted in Book Reviews and tagged fantasy, government, imprisonment, multiple viewpoints, princesses, prisoner by Aliya A.. Bookmark the permalink.